Things have unravelled a bit with respect to posting regular updates of the Mt. 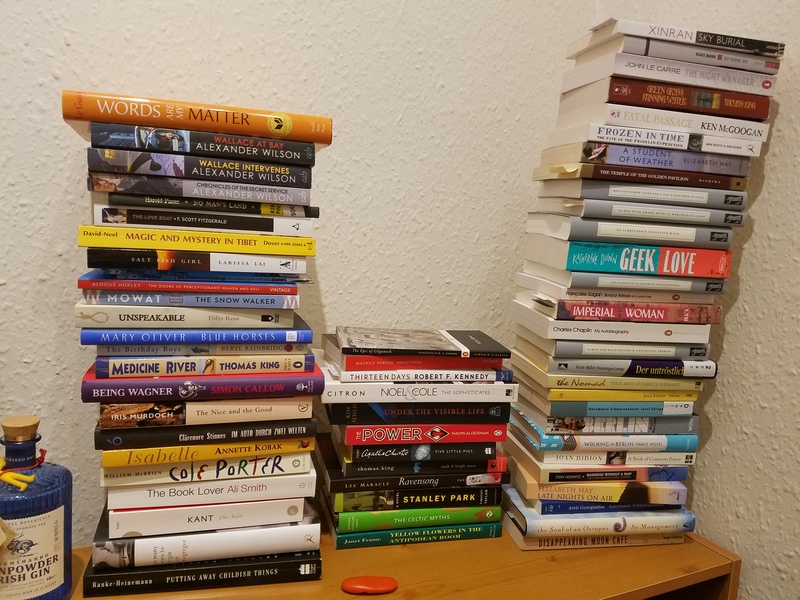 TBR Project and with respect to keeping track of which books I have read over this year. That is, erm, I never posted an End-of-October update and I did something to my spreadsheet that…well, I don’t believe the numbers I’m getting on the TBR percentages (original pile vs. new additions vs. books read in other formats) are right. But since there is only a month to go, and I would be wasting valuable reading time in trying to figure out where I went wrong, I am just not going to fix this. I think the update picture will speak for itself that this year’s method of reducing Mt. TBR has worked. Also, I now have a total of 7 books that I haven’t deducted from the piles as “swaps”, yet. I.e. 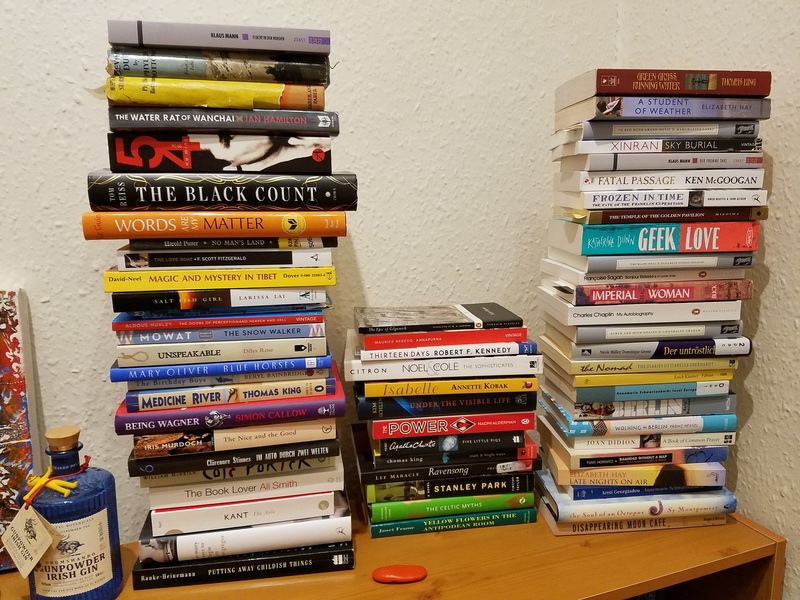 7 books I read from my own shelves that aren’t on Mt. TBR. I’ll apply any swaps at the end of December. Also, I have come to the conclusion that there is a flaw in this year’s MT. 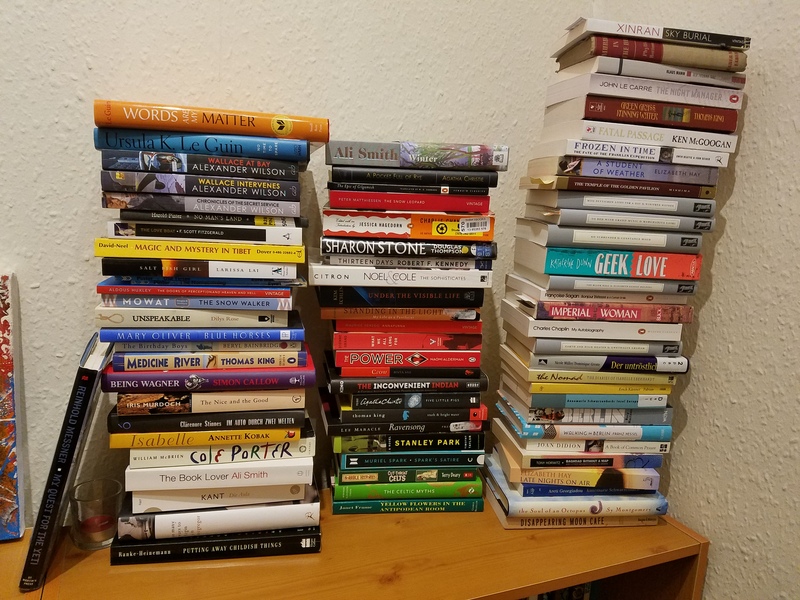 TBR reduction method as it is unlikely that newly bought books will be read straight away and putting them on Mt. TBR defeats the purpose of trying to read the books that have been sitting on my shelves for ages, in some cases years. So, I am not adding the most recent additions (small pile on the left) to the official Mt. TBR. The next time I set up a Mt. TBR Project, I will likely set a cut-off date after which books will not be added…or I will just track the new additions in a separate way. We’ll see. (The actual pile for MT. TBR Project purposes is the one on the right. Next Next post: Reading progress update: I’ve read 64 out of 412 pages.